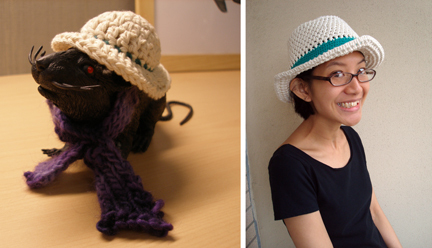 Or, the traveling hat of Raticus, part 2. I was hoping for a character in a Miyazaki movie. It’s true. Take a look. I decided to also write down the pattern, since it’s been a while since I’ve shared a pattern. I opted for a hdc‐ch 1 pattern repeat because it kind of looks woven. And the band of contrasting colour is made with a lighter yarn to create a bit of variation in texture. 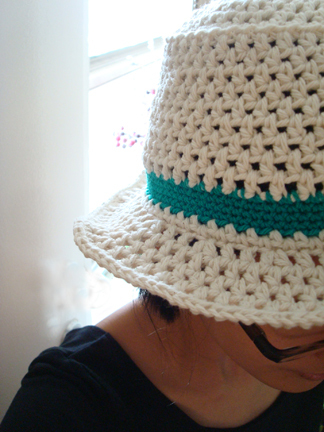 Hat is crocheted in the round. Each round starts with a beginning ch and ends with joining at the beg ch. inc. (increase) = [hdc, ch 1, hdc] in ch 1 sp. Rd 1: in magic ring, ch 2, 11 hdc, sl st in top of beg ch to join. Rd 2: ch 3, *inc. in next st, ch 1, hdc in next st, ch 1* repeat from * to * around, end with inc. in the last st, ch 1, sl st in 2nd ch of beg ch to join. Rd 3: sl st into first ch 1 sp, ch 3, hdc in next ch 1 sp, ch 1, inc. in next ch 1 sp, ch 1, *[hdc, ch 1] in next 2 ch 1 sp, inc., ch 1* repeat from * to * around, sl st in 2nd ch of beg ch to join. Rd 4: sl st into first ch 1 sp, ch 3, [hdc, ch 1] in next 2 ch 1 sp, inc., ch 1, *[hdc, ch1] in next 3 ch 1 sp, inc., ch 1* repeat from * to * around, sl st in 2nd ch of beg ch to join. Rd 5: sl st into first ch 1 sp, ch 3, [hdc, ch 1] in next 3 ch 1 sp, inc., ch 1, *[hdc, ch1] in next 4 ch 1 sp, inc., ch 1* repeat from * to * around, sl st in 2nd ch of beg ch to join. Rd 6: sl st into first ch 1 sp, ch 3, [hdc, ch 1] in next 4 ch 1 sp, inc., ch 1, *[hdc, ch1] in next 5 ch 1 sp, inc., ch 1* repeat from * to * around, sl st in 2nd ch of beg ch to join. Rd 7: sl st into first ch 1 sp, ch 3, [hdc, ch 1] in each ch 1 sp around, sl st in 2nd ch of beg ch to join. Rd 8: sl st into first ch 1 sp, ch 3, [hdc, ch 1] in next 5 ch 1 sp, inc., ch 1, *[hdc, ch1] in next 6 ch 1 sp, inc., ch 1* repeat from * to * around, sl st in 2nd ch of beg ch to join. sl st into first ch 1 sp, ch 3, [hdc, ch 1] in next 6 ch 1 sp, inc., ch 1, *[hdc, ch1] in next 7 ch 1 sp, inc., ch 1* repeat from * to * around, sl st in 2nd ch of beg ch to join. *Omitting or adding a round should subtract or add 1″ to hat diameter. For Rd 9 only, crochet into the ch 1 itself, instead of in the ch 1 space. This will create a sharp downward folding edge at the crown of the hat and give the hat its bucket shape. Rd 9: sl st into first ch 1, ch 3, [hdc, ch 1] into each ch 1 around, sl st in 2nd ch of beg ch to join. Rd 10 -12: sl st into first ch 1 sp, ch 3, [hdc, ch 1] in each ch 1 sp around, sl st in 2nd ch of beg ch to join. Rd 13: sl st into first ch 1 sp, ch 3, [hdc, ch 1] in next 10 ch 1 sp, inc., ch 1, *[hdc, ch1] in next 11 ch 1 sp, inc., ch 1* repeat from * to * around, sl st in 2nd ch of beg ch to join. *If rounds were omitted or added at the crown, just evenly place 4 increases around. You can count the total number of ch 1 spaces (including the beg ch) and divide it by 4, or just eyeball it. Rd 14–17: sl st into first ch 1 sp, ch 3, [hdc, ch 1] in each ch 1 sp around, sl st in 2nd ch of beg ch to join. *If you want to make the hat taller and wider, add another round with 4 evenly placed increases around somewhere between Rds 14 and 17. Join contrasting colour yarn, but don’t fasten off main colour yarn. Carry main colour yarn up at the beginning of each round with the contrasting colour. sc into each of the ch 1 sp and hdc. Beginning ch 1 does not count as sc in this section. Rd 18: ch 1, sc in same st, sc in next 11 st, 2 sc in next st, *sc in next 12 st, 2 sc in next st* around, sl st in first sc. *if you’ve subtracted or added rounds previously, your stitch count may not match with mine. But that’s okay, the idea of Rd 18 is just to make an increase every 12 stitches or so to compensate for the thinner contrasting colour yarn. Rd 19–21: ch 1, sc in same st, sc in each st around, sl st in first sc. Fasten off contrasting colour, place main colour back on hook. Rd 22: ch 1, sc in same st, ch 1, [skip next st, sc in next st, ch 1] 11 times, skip 2 sts, sc in next st, ch 1, *[skip next st, sc in next st, ch 1] 12 times, skip 2 st, sc in next st, ch 1* repeat from * to * around until there are 12 stitches left, [skip next st, sc in next st, ch 1] in remaining sts, sl st in first sc. *if you’ve subtracted or added rounds previously your stitch count in Rd 22 may not match mine. But that should be okay. The decreases in Rd 22 is just to make a decrease every 12 sc’s or so to compensate for the differences in yarn weight when switching back to the thicker main colour yarn. Rd 23: ch 1, sc in same st, ch 1, [skip next st, sc in next st, ch 1] around, sl st in first sc. For Rd 24 only, hdc into the ch 1 around the front loop of the chain only. This will make the fabric fold outward. Rd 24: sl st into first ch 1 around the front loop only, ch 3, hdc into next ch 1 around the front loop only, ch 1, inc. in next ch 1 around the front loop only, ch 1, *[hdc, ch 1] in next ch 1 around the front loop only, inc., ch 1* around, sl st in 2nd ch of beg ch. Rd 25: sl st in first ch 1 sp, ch 3, [hdc, ch 1] in each ch 1 sp around, sl st in 2nd ch of beg ch. Rd 26: sl st in first ch 1 sp, ch 3, [hdc, ch 1] in next 16 ch 1 sp, inc., ch 1, *[hdc, ch 1] in next 17 ch 1 sp, inc., ch 1* around, sl st in 2nd ch of beg ch. *Again, if you’ve added or subtracted rows/stitches previously your stitch count will not match mine. But just make an increase every 17 hdc’s or so. Rd 27: sl st in first ch 1 sp, ch 3, *[hdc, ch 1] in each ch 1 sp until inc. st in previous round, inc. in inc. st in previous round, ch 1* repeat from * to * around, sl st in 2nd ch of beg ch. Rd 28: ch 1, sc in same st, sc in each of the hdc and ch 1 sp around, sl st in beg sc, fasten off. Weave in ends. First time writing pattern for a hat, hope it all makes sense! As usual, if you spot any mistake please let me know! Now that is one cute hat, and love the story that goes with it! 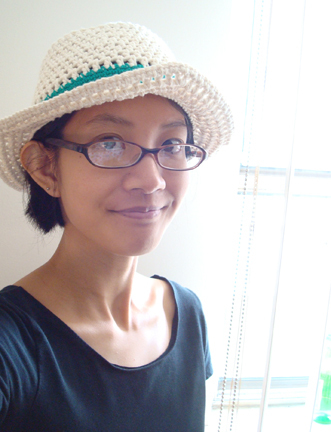 I am a total non‐hat person but love them on other people :-). Hope you have a wonderful weekend! you look really nice in it. Very cute! (Plus, you remind me of my friend’s wife, Dan, who’s super smart and adorable, so that’s a strange kind of plus.) I’m going to make one of these for myself for this summer; hopefully I can even get it done this week so I can wear it when we visit my aunt in California (would be perfect to take on a trip). Thanks for the pattern! This is so cute! I’m gonna have to make one. I’d love for you to link up at my new link party for the fiber arts! Wow, did I ever luck out! 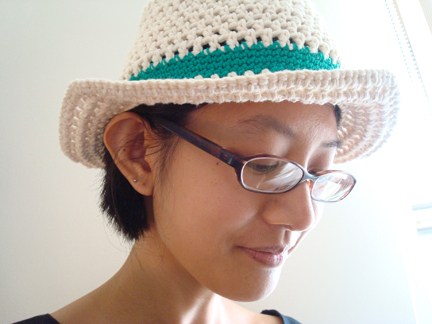 I was looking for a hat to crochet, and this is just *poifekt*! I haven’t crocheted since I was a kid, and I never *did* learn to read a pattern, so I haven’t the foggiest notion what this says, but I’ll go look it up because I can find anything on the net. I’m gonna make this out of rayon yarn so it’ll be cool and shiny, and I have a lovely raspberry sherbet here that’s more saturated, so it’s a gorgeous pink. Thanks a million for going through the effort to put that secret code (well, that’s what it looks like ;-) up here so we can have a cool hat like yours. It’s just terrific!